How are the “ITOKAWA” asteroid particles collected by “HAYABUSA” (spacecraft) investigated? Is a superconducting magnet actually a permanent magnet? How do we figure out the 3D structures of proteins? Has PCB contamination spread even to Antarctica? Along with progression of science, even more questions are raised from various angles. This page will guide you to the world of “Simple Science” (simply explaining the science and the state-of-the-art technologies) with translation examples. 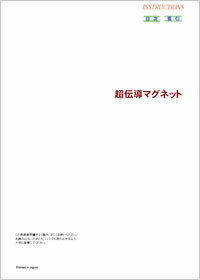 In this page, a portion of “Simple Science” on the JEOL homepage and other articles are recomposed and translated to be more accessible. “What can we see by magnifying an object?” To satisfy this curiosity, various inventions were created. One of them is the optical microscope (OM). The smallest object size detectable by the human eye is limited to about 0.2 mm. The OM can help us to see very small objects that are not visible by the human eye. This is achieved by magnifying the small object with the aid of a combination of glass lenses. But even using the maximum magnification of the OM, the OM cannot show us an atom. This is because the OM uses visible light as the illumination beam. That is, the capability of distinguishing different structural objects (resolution of OM) is fundamentally restricted by the wavelength of light. Unfortunately, the size of one atom is greatly smaller than the wavelength of the light. Ruska and his group (Germany) broke through this resolution limit. They invented an Electron Microscope (EM) that uses an electron beam as the illumination beam, instead of light. The wavelength of the light is as large as 400 to 800 nm (1 nm = 0.000001 mm). However, the “wavelength of an electron beam” is as small as “0.0025 to 0.0037 nm”. This remarkably small wavelength enables the Electron Microscope to resolve (visualize) the world of atoms (a few nm down to 0.1 nm or less). The OM uses glass lenses to magnify and project the image of an object. In the imaging process, the glass lenses refract the light coming out from the object and change its direction. In comparison, the Electron Microscope (EM) uses electromagnetic lenses (lenses made of electromagnets). The electrons transmitted through or scattered from the object are deflected by the magnetic forces of the electromagnetic lenses and then, a resultant image is magnified onto a viewing screen (fluorescent screen, etc). Particles collected by “HAYABUSA” (Japanese spacecraft) from the Asteroid ITOKAWA are subjected to various analyses using a Transmission Electron Microscope (TEM), a Scanning Electron Microscope (SEM) and an Electron Probe Microanalyzer (EPMA). TEM and SEM are used for observing structures, morphology and surfaces of the particles. EPMA is used for analyzing the constituent elements in the particles. The EPMA is an instrument that irradiates the surface of a substance with an electron beam, and measures characteristic X-rays generated from the substance to qualitatively analyze the elements contained in the substance and to perform element-distribution analysis of the substance. Is a SCM actually a permanent magnet? The electric resistance of some special alloys, such as niobium titanium and niobium tin, becomes 0 ohm when they are cooled by liquid helium (about ?270 ?C). When making a ring (coil) with the wire made of this kind of alloy (superconducting wire), and applying electric current to the ring (coil) cooled by liquid helium, the current continues to flow forever (permanent current) because of the zero resistance. If electric current flows through a ring (coil), the coil becomes a magnet. So, a coil with a permanent current flow is a permanent magnet. However, the liquid helium evaporates and decreases. You have to continue to refill liquid helium in order to continuously cool the ring. 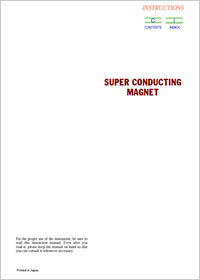 The superconducting magnets (SCM) used for nuclear magnetic resonance (NMR) instruments provide a highly homogeneous and stable magnetic field. There is a vertical hole (the bore) that goes right through the center of the cylindrical tank of the superconducting magnet. The magnet generates a strong magnetic field at the center of the bore. Two tanks are concentrically arranged inside and a group of coils made of superconducting wires is in the innermost liquid-helium vessel. The permanent current in the superconducting wire of the SCM will maintain the magnetic field without connection to any external power supply. As long as you maintain the supply of liquid helium to keep it cool, the current continues to flow in the coil, and the magnetic field is maintained without any external power supply. Since liquid helium evaporates and decreases little by little, you have to refill liquid helium periodically. In order to reduce liquid helium boil-off, a liquid-nitrogen vessel surrounds the helium vessel. Two liquefied-gas vessels are inside the outer stainless steel vacuum jacket for thermal insulation. Pipes on top of the jacket are used as an outlet for evaporated gasses and an inlet to refill with liquefied-gasses. Proteins are one of the most important components of our bodies. Proteins are composed of atoms, such as carbon, oxygen, hydrogen, and nitrogen. But what is the sequence of the connections of those atoms, and what is the spatial relationship between the atoms? Nuclear Magnetic Resonance (NMR) is one of the tools used to examine the inner structure of proteins and research the planar and 3D structures. Some atoms, such as hydrogen, have nuclei that behave like small magnets. These small magnets spin like a spinning top, and will swing when placed in a large magnet (external magnet field) in the same way that the spinning top swings around its axis. This swinging movement is called “precession”, and the swinging cycle (frequency) is determined by each nucleus. When a radio wave that has the same frequency as that of the precession is applied to an atom, the energy of the radio wave is absorbed and released (this is called “resonance”). We can detect the resonance by measuring the released energy as an electric signal. The electric signal caused by the resonance is called “NMR signal”. When the magnetic field is 11.74 T (tesla), a hydrogen nucleus (proton, 1H) resonates with a 500 MHz radio wave. This resonance frequency varies depending on the specific nucleus, for examples, 125 MHz for 13C and 50 MHz for 15N. The resonance frequency of the proton NMR signal slightly varies depending on a type of molecular group, such as CH3 (methyl group), CH2 (methylene group), and H2O (water), even though the signal comes from the same proton. This frequency separation is called a chemical shift because it is caused by the difference of the chemical environment around the nucleus. The NMR signals are also split by the mutual interference (spin coupling), and the NMR signal intensity varies depending on the distance between atoms (NOE: Nuclear Overhauser Effect) when the atoms are spatially close. So, measuring such information enables us to analyze the 3D structure of substances. 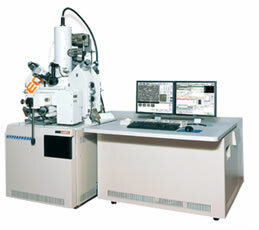 The nuclear magnetic resonance (NMR) instrument has had a great impact on the analysis of materials like organic compounds such as medicines and agricultural chemicals, polymer materials such as plastics and polyethylene, and organic substances (mainly living substances like proteins) that consist of atoms such as carbon, oxygen, hydrogen, nitrogen, and phosphorus. Especially, since NMR instruments can reveal the planar structures and also 3D structures to show how the atoms connect with each other, the NMR instrument is indispensable for the analytical investigation of the above organic compounds. Furthermore, NMR instruments are used for analysis of solid materials, including measurements of the diffusion factor that indicates the performance of a battery such as the lithium-ion battery, and to analyze environmental hormones, so that the applications for NMR continue to grow. When examining the penguins and their foods in Antarctica, a tiny amount of PCB (polychlorinated biphenyl) has been detected by using the Mass spectrometer. PCB is an insulating material that is chemically stable and is frequently used in the electric products. But, if it enters a living body, it becomes hazardous due to its accumulation and toxicity. Dioxins (one type of PCB) are known to be especially toxic. The PCB contamination might be spread due to the air movements and the food chain, and in fact, PCB has been detected even in the polar bears at the North Pole. The Mass spectrometer is an indispensable analytical instrument for detection and analysis of the low concentrations of PCB and environmental hormones, and is fully used in the world. Using the mass spectrometer (MS spectrometer), you can accurately measure the mass (heaviness) of each component of a substance, and from the masses, you can determine what compounds are contained in the substance, as well as the quantities of each compound. As a basic theory, the mass spectrometer uses the properties of the ion (atom or molecule transformed into electrically charged particles). That is, when an ion is accelerated to a suitable velocity and passed through a magnetic field, the trajectory direction of the ion is altered by the force of the magnetic field with the amount of alteration depending on the mass (heaviness) of the ion. This theory is similar to that of the Braun tube (cathode-ray tube: CRT) of a television, which uses electrons whose trajectory directions are altered by being passed through a magnetic field. As shown in Figure (a), when all ions are accelerated by the same energy at the left side, if the strength of the magnetic field is constant, the trajectories of the ions bend due to the influence of the magnetic field, with the small (light) mass ions bending more than the ions with larger (heavier) mass numbers. Therefore, if you can acquire the mass spectrum by detecting the positions where the ions arrive, you can know what ions the substance consists of (qualitative analysis), and the quantity (quantitative analysis). For an actual mass spectrometer, the type and quantity of ion are measured using a detector by fixing the trajectory and varying the strength of the magnetic field as shown in Figure (b). The detected signals are displayed as many peak groups in a graph (c) called the mass spectrum, where the horizontal axis indicates the mass-to-electric-charge-ratio (m/z) and the vertical axis indicates the intensity of each ion (quantity). In order to perform the separation of a mixed sample with high sensitivity, the gas chromatograph (GC: an instrument for separating mixed samples) has been combined with the mass spectrometer. This instrument has developed into the Gas Chromatograph Mass Spectrometer (hereafter abbreviated GC/MS), and has become an important tool used in a wide range of fields for measuring dioxins, environmental hormones, organic compounds in tap water, and drug concentrations in blood. The GC/MS is also used as a tool to develop new drugs. Among the gas chromatograph mass spectrometers, there are many types of instruments, from the instrument installed on a space probe to measure the elements of Mars or a comet, to the instruments used to analyze proteins to determine the structures. The gas chromatograph mass spectrometer will be more widely used in the environment and life science field, and continuing development is expected. In a similar way, liquid chromatography （LC） has been combined with the mass spectrometer, to develop the Liquid Chromatograph Mass Spectrometer (LC/MS). The LC/MS is widely applied as an analytical tool in the fields related to volatile as well as nonvolatile compounds. Furthermore, in recent years, a new type of the mass spectrometer, TOF/MS (Time-of-Flight Mass Spectrometer) has been developed. TOF/MS acquires the mass of ion by measuring the flight time after the ion is accelerated by an acceleration voltage until it arrives at the detector. Also, the development of the MALDI ionization method, that was awarded the Nobel Prize in Chemistry, makes the mass analysis of biological macromolecules such as proteins easier. As seen above, the mass spectrometer continues to be developed.